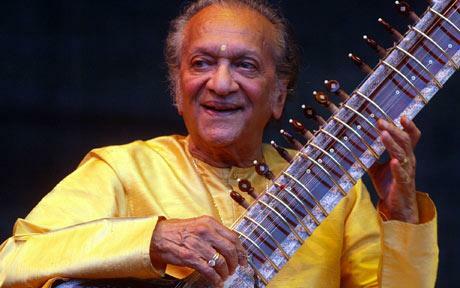 Ravi Shankar passed away earlier today. Named "the godfather of world music" by George Harrison and a national treasure by Indian Prime Minister Manmohan Singh, Ravi Shankar was a sitar virtuoso and a legendary composer. Idol Threat favorite John Coltrane was greatly influenced by Ravi but unfortunately never managed to collaborate with him on record before his own death. His son Ravi Coltrane was named after Shankar. Ravi was the father of singer Norah Jones and musician Shubhendra "Shubho" Shankar who himself passed away in 1992. A statement on the musician's website said he died in San Diego, near his Southern California home. On December 6, 2012 Shankar was admitted to Scripps Memorial Hospital in La Jolla, San Diego after complaining of breathing difficulties. The musician's foundation issued a statement saying that he had suffered upper respiratory and heart problems and had undergone heart-valve replacement surgery last week. RIP Ravi.